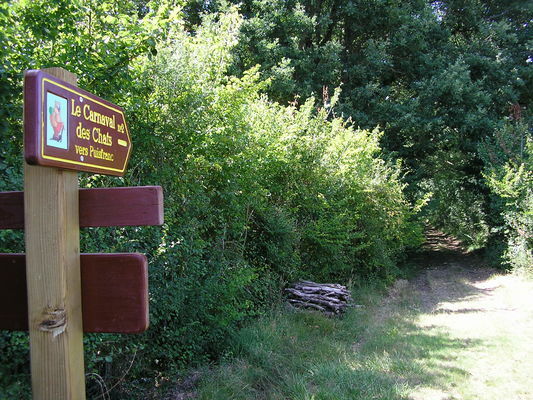 The Croix des Pagenauds (Les Pagenauds Cross), which dates from 1839 and is located close to the village that bears the same name, also used to be known as the “Croix Chadrat”. There is a saying: “At Mardi-Gras all the cats go to the Croix Chadrat”. Indeed, according to legend, cats get together on Mardi-Gras, usually at a crossroads or by a cross, in order to celebrate this festival, also known as Carnaval. They start by raiding houses for the pans, flour, sugar and eggs they need to make their crêpes. Woe betide anyone who followed them to their gatherings! The fate awaiting those who thought to venture that far is unclear! Throughout the Montmorillon region, there are other communes with crosses where cats gather: in Sillars and also in Nalliers. This circuit is one of 12 circuits known collectively as "Le Carnaval des Chats”, located in the Antigny, Haims and Jouhet area. There is no review about The Cats' Carnaval / Circuit 12, be the first to leave one !